Quick and easy Paleo glazed carrots that you can make on the stovetop or baked in the oven! Cut the peeled carrots into quarters. Bring slightly salted water to a boil in a large pot with a steamer basket. Let carrots steam until just tender, about 8 minutes. Drain the carrots, remove the steamer basket from the pan, place cooked carrots back into the pan then toss with the oil, honey, salt, pepper, and fresh thyme. Sauté for about 5 minutes on a medium high heat, then serve hot. To bake in the oven, steam the carrots as directed above, drain, and then toss with the oil, honey, salt, pepper as before. 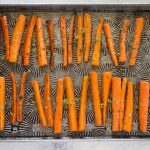 Place the carrots evenly on a parchment (not waxed paper or foil) lined baking sheet and bake for 20-25 minutes. Sprinkle over the fresh thyme leaves in the last 5-10 minutes of cooking.